AZD3229 is a potent, pan-KIT mutant inhibitor with potent single digit nM growth inhibition against a diverse panel of mutant KIT driven Ba/F3 cell lines (GI50=1-50 nM), with good margin to KDR-driven effects. It also inhibits PDGFR mutants (Tel-PDGFRα, Tel-PDGFRβ, V561D/D842V). In preclinical species, bioavailability is high and clearance low across all of mouse, rat, and dog. Volume of distribution is low consistent with the neutral structure. In in vivo models using Ba/F3 cell lines, AZD3229 at a dose of 20 mg/kg b.i.d induces tumor volume regression more effectively than regorafenib at a dose of 100 mg/kg q.d and imatinib. Kettle JG, et al. J Med Chem. 2018, 61(19):8797-8810. Nathália C. Campanella, et al. GIST. 2018. 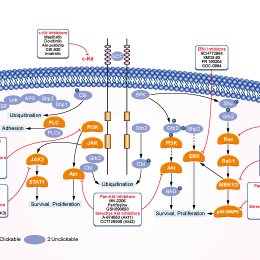 Masitinib is a novel inhibitor for Kit and PDGFRα/β with IC50 of 200 nM and 540 nM/800 nM, weak inhibition to ABL and c-Fms. Phase 3. OSI-930 is a potent inhibitor of Kit, KDR and CSF-1R with IC50 of 80 nM, 9 nM and 15 nM, respectively; also potent to Flt-1, c-Raf and Lck and low activity against PDGFRα/β, Flt-3 and Abl. Phase 1. 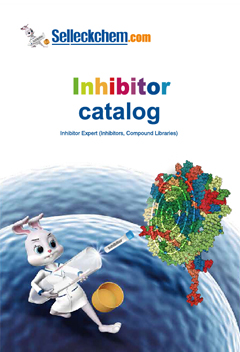 Amuvatinib (MP-470) is a potent and multi-targeted inhibitor of c-Kit, PDGFRα and Flt3 with IC50 of 10 nM, 40 nM and 81 nM, respectively. Phase 2.